Having the shuttle driver transport me back to the city of London because I forgot my paddle wasn’t the best way to start an epic journey down the full length of the Thames River in southwestern Ontario. It took several hours out of my scheduled first day. Making it worse was not having my planned campsite available as well, forcing me to pitch my tent in some stranger’s backyard. The good news is that the stranger offered me a cold beer while I setup my tent beside his kid’s trampoline. His wife even offered my coffee in the morning. How cool is that? High water levels got me from Woodstock to Dorchester the first day along the South Branch of the Thames. This section is an absolute oasis. Hamlets, roads, train tracks and cement kilns clutter the edges of the river, but the high, wooded banks hid everything from sight; and the constant birdsongs blocked the sounds of all the business going on away from the river. I even had the waterway all to myself for the most part. I only met up midday with a local farmer and his granddaughter floating past me on a makeshift raft, fishing for brown trout with bamboo poles, a bobber, hook and worm. I had company on day two, from Dorchester to the city of London. Andrew, Chris and his son Benjamin. They’ve volunteered to map the Thames for paddlers, Thames River Paddling Routes, and organize an annual river clean-up. The river continued to be wild, except for brief encounters with golf courses and road bridges—even while it cut through the centre of London. If it wasn’t for the odd shopping cart littering the bank or seeing families enjoying a bicycle ride along the river trail, you wouldn’t even know suburbia existed all around you. I did, however, have to think outside the box on where to camp the second night. But I managed. A short portage to the left of a moderate spillway, the only portage on my entire eight day (300-kilometre) trip, followed by 300 metres of sidewalk, brought me to Idlewyld Inn & Spa. I literally pitched my solo tent on a king-size bed, ordered a medium pepperoni pizza and watched Raiders of the Lost Arkon a big screen TV. I gotta say, it wasn’t a bad campsite. The big disappointment of day three was that the city fountain was turned off at the forks of the Thames. It was the beginning of a heat wave, with temperatures that day reaching 38 degrees Celsius. Floating under the spray would have been refreshing, to say the least. The beauty of this next stretch, London to Delaware, accompanied with plenty of swifts and rapids to run along the way, helped keep my mind off the heat. I was also awestruck by the constant and diverse wildlife sightings: bald eagles, osprey, red-tailed hawks, spiny-soft shelled turtles, gar pike, cliff swallows, bank beavers, muskrat and countless songbirds. My plan was to camp my third night in the un-cut grass next to the parking lot of Delaware Conservation Area. I thought up a better option, however. Good friend Tim Millar of Nova Craft Canoe lives a couple blocks up from the Conservation Area. I couldn’t pass up his offer of an air-conditioned house and a fridge full of cold beer—especially Upper Thames Brewing Co.’s Portage India Pale Ale and Backpaddle Blonde Ale. 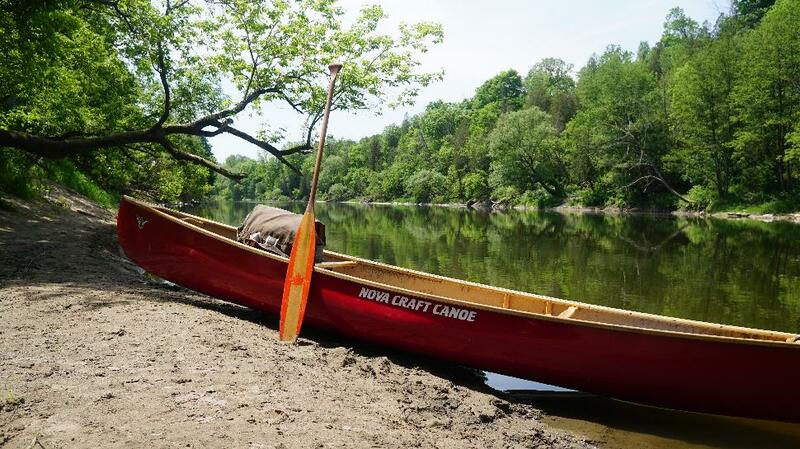 Kevin Callan just spent eight days paddling Ontario's Thames River. Want to find out what gear he relied on? Kevin Callan talks about eating bugs—crickets—for protein. Kevin Callan slowed things down a bit and combined paddling with cultural exploration in Ontario.